How to experience the very best of Buenos Aires in just 5 days. Never fear, hit and run traveler. Here’s the crash course to a city with some of the world’s greatest nightlife, cafes and dining. You’ve been traveling for hours. You almost broke the door of the flimsy taxi that dropped you at your short-term rental apartment in Palermo. You’re exhausted, hungry, and Delta misplaced one of your bags. But tonight is your first night in Buenos Aires. You grab a nap and a shower and order a steak at the café next door. You’re itching to experience some of the best in Latin American nightlife. 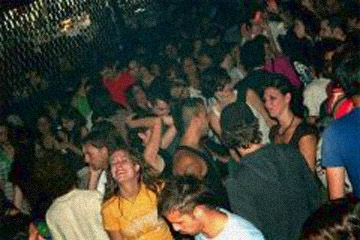 It’s Wednesday and you’ve read about a notorious global hip hop party across the railroad tracks in Palermo Hollywood. You make your way to Niceto and hit the line at the door. There are hipsters in converse and skinny jeans, but they’re so much better looking here. By midnight and you like what you see. There are hipsters in converse and skinny jeans, but they’re so much better looking here. By the time you graduate to the club entrance, you decide the stereotypes were all too true – Buenos Aires is full of beautiful people. Inside, there’s a cumbia / emcee duo rapping along to a dubby, hip-hop version of the indigenous rhythm. They play toy keyboards with mouthpieces and employ masked disguises. They’re followed by a female rapper, Princesa, who also rhymes to cumbia-infused beats. Then it’s Villa Diamante on the ones and twos and you’re intrigued by his choices, vowing to locate a mixtape online. Niceto has a brilliant sound system and your friend who’s been living in Buenos Aires for the past couple of months convinces you to order a Fernet and Coke, a medicinal sort of herbal concoction. The drink wakes you up and gives you a happy buzz. At 3 am you hop in a cab to Recoleta. Rumi is good on Wednesdays and shows off a different side of Buenos Aires than what you experienced at Zizek. Bottle service and Brazilian models make for a nice contrast with the cumbia underground kids. You last until about 4:30 at Rumi and, with the party in full swing, bow out for a well-deserved rest. You sleep in and make your way to Plaza Serrano for breakfast – fresh squeezed orange juice, a cappuccino and three croissants for the equivalent of $2.50 USD. You like it here already. The plaza is more traffic circle than anything else, but it manages to afford some awesome people watching. There are cafes on every corner and crafts and clothing sold in the plaza and on the sidewalks. There’s an easy sort of hustle to the area and it’s fun to walk around and try to get your bearings. You’re in Palermo Viejo, on the Soho side of the train tracks, east of downtown. It’s said to be the hippest part of town and by the looks of the indie designer boutiques and the Diesel store on the corner, you agree. You make your way down Gurruchaga to El Salvador street and then head to Plaza Armenia and the park – where there’s another outdoor fair with local artisans selling jewelry, pottery, and art. You’re tempted by restaurants on every block and make a mental note to come back for as many meals as you can handle. By now it’s nearly noon – lunchtime for much of the world but not by Argentine standards. You still have a good couple of hours so you walk down Armenia toward the Botanic Gardens in Palermo Park. Nearby is the Evita museum and you’d like to cross that one off your list before you get completely immersed in the weekend. You learn a lot about the feminine rights movement in Argentina, about Juan and Eva Peron’s particular brand of fascism, and about fashion. The new museum is an interesting combination of politics and show business, reminiscent of Ronald and Nancy Reagan, minus the greed. You’re glad to erase the Madonna version from your consciousness and replace it with the country’s national heroine whose rags to riches legacy includes women’s suffrage, the national mobilization of workers, foreign diplomacy, and a post-mortem kidnapping. All this learning has made you hungry. You hop in a cab and head back into Soho to Freud and Fahler for lunch. Freud and Fahler is a charming, European café on Gurruchaga that has an amazing lunch special paired with the best white wine you’ve ever had. It’s a blend of Chenin and Chardonney and it tastes like cool, melted citrus. You’re at a sidewalk table munching on bakery breads and some kind of spread that tastes healthy and rich at the same time. After your organic greens and a risotto, the bill comes in just under $12 USD. You make your way back to the apartment for a siesta. At 10pm you enter La Cabrera on Niceto and Serrano. You’ve been told it’s the best parilla in Palermo and you are ready to see what all the fuss is about. The steak comes out on a chopping board with an array of vegetable accessories including marinated peppers, olives, pureed pumpkin, eggplant in olive oil, and baby red potatoes. The caprese salad that seemed like such a good idea as a starter is now an obstacle for the task ahead of you. You do your best and are thankful your friends were smart enough to suggest you share entrees. The people at the table next to you were really friendly and suggest you join them for a drink. From La Cabrera, your group makes its way to Milion, a mansion-turned-bar in Barrio Norte. Milion is elegant and exclusive. The drinks are impressive and you hang out on a balcony overlooking a large garden. From the street you never would have guessed this place could look the way it does – straight out of a 19th century Louisiana plantation. The polo players and European expatriots are chatty, but after two rounds you decide to try Cocoliche, the downtown alternative to Milion. Cocoliche is Bohemian and eclectic, in a European squat meets New York City’s Lower East Side kind of way. A taxi drops you on a residential street and you have to ring a bell to get in. It feels like trespassing as you make your way upstairs to the parlor where there’s an art exhibit by a local photographer. Then you head into the main room and the bar and you’re glad you left Milion. This is what you came to South America for. Cocoliche is Bohemian and eclectic, in a European squat meets New York City’s Lower East Side kind of way. It’s random and entertaining in the bar where cool locals drink cans of Quilmes or Fernet-Cokes. Downstairs a deejay plays to a dark room as the dance floor fills up. Cocoliche is the perfect transition from Milion to the last stop for the night: Kim y Novak. A local recommends the spot as “fantastic trash” and claims it rivals London or New York for dirty chic. At Kim y, a crowd similar to the one at Cocoliche and at Niceto spills out the door onto the sidewalk, drinks in hand. You immediately notice the colorful, vinyl booths and artsy décor and the transvestite clique that occupies the middle of the bar. Downstairs in the cave there are deejays and action on the dance floor, despite signs that prohibit dancing. There’s also plenty of action in the bathroom, apparently, from the long lines and socializing going on in front of the unisex doors. 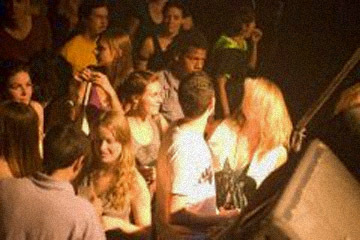 The entire place is sexually ambiguous and chaotic – it’s an entertaining end to a fun-filled night on the town. It’s dawn when you realize you’re very close to your apartment. You stumble home and take your drink to go. It’s Friday and you’ve decided to leave Palermo and explore old Buenos Aires. You’ve scheduled a walking tour of downtown and San Telmo. You meet your guide at Cafe Tortoni in Microcentro (downtown). Alan Patrick is English and has been giving historic tours of downtown for the past couple of years. He shows you La Casa Rosada (Argentina’s White House) in Plaza de Mayo, site of the meetings of the Madres de Plaza de Mayo every Thursday afternoon. The Madres organized a resistance and an official reckoning in response to the 30,000 disappearances by the Argentine dictatorship of the late seventies and early eighties. They continue their work of searching for the remains of lost family members and their abducted children, and of holding members of the military regime responsible for their crimes. Next, Alan leads you into the grand Cathedral of Buenos Aires off the plaza, then down Peru street past a number of milongas. The milongas are where tango shows take place, and some nearby murals depict the history of the tango. Other murals tell of social protest and the rise of the labor unions that continue to hold influence over national politics. You learn that Argentina has the second highest education rate of Latin America, just under Cuba. You pass a restaurant called Rey Castro and are surprised to learn that Fidel enjoys popularity in Argentina, alongside his compadre, national hero Che Guevara. In San Telmo, you learn about the history of the conventillos. They are mansions that became tenement houses after yellow fever caused the city’s wealthy class to move to higher ground in Recoleta and Belgrano. The aristocracy abandoned their property in the 19th century and newly arriving Italian and Spanish immigrants took over the large French homes and converted them to apartments. You take a tour of El Zajon, the most famous conventillo, that includes secret passageways. Finally, you end up in Plaza Dorrego, the heart of San Telmo, where you peruse crafts and watch live candombe drummers accompanied by dancers. Alan Patrick is a fan of the artisanal beer available at one of the cafes so you enjoy a stout brew with him before heading over to meet friends for a late lunch at Desnivel. Rather than discouraging your stomach, last night’s meal has only made your craving for Argentine carne that much stronger. Desnivel is a world away from the formality of La Cabrera. It’s a meeting hall sort of restaurant with a butcher’s case at the entrance and sausage links and other cuts of meet hanging from the ceiling. You start the meal with the traditional chorizo appetizer and find it totally different from the Mexican chorizo you know. It’s more like the beef blend version of an Italian sausage. It comes with chimichurri, Argentina’s only use of spice, but you don’t need it. This is the most flavorful piece of meat you’ve ever encountered and you understand why choripan, chorizo in a half baguette, is the man-on-the-street’s lunch of choice. Your entrée, or plato principal, has a similar name but is an entirely different dish. A bife de chorizo is a great cut of steak. You’ve ordered the mini and it’s plenty along with the pure mixto, mashed potatoes and mashed pumpkin, plus a salad. Lopez is the popular red wine blend of Malbec and Cabernet found in most restaurants in town. It is surprisingly good at $7 USD a bottle. You have to walk off lunch so you wander through San Telmo peering in the windows of the antiques shops and walking through the Mercado de Antiguedades where stands and stores of collectibles include leather bags, vintage movie posters, chandeliers, jewelry, and rare books. You pass the historic Bar Britanico, its utilitarian interior is night and day from the elegant Tortoni but rich in history. You cross Brazil street and enter Parque Lezama just in time for a free concert in the park. There’s a local rock band and their fans join neighborhood families and couples seated in the open air ampitheater. The sound is surprisingly good and the place is the perfect precursor for your plans for the night. You have tickets to see a band you like at a rock venue in Palermo. You head back to your apartment to freshen up before an 11pm dinner reservation in Palermo Hollywood. Green Bamboo is a hip, Vietnamese-fusion restaurant and bar in the heart of Palermo Hollywood, a neighborhood named for the recent proliferation of TV studios on its streets. The Belgian bartender at Green Bamboo makes you a fresh papaya and ginger vodka smoothie that sets the tone for the meal. You enjoy a seafood curry in a pop art setting that is just the counterpoint to your afternoon in San Telmo. From Green Bamboo you hop a cab to Salon Pueyrredon to see Los Peyotes, a Buenos Aires, sixties style, garage rock band. The space is another old frenchie mansion but the walls have been painted red and the bar is legitimately punk rock. The band hits the stage in fake fur vests and false saber-tooth necklaces with bowl-cut hairdos. They are amazing and the room is packed with pogo-ing Argentines. Deejays follow the band and the party goes until 6am when the crowd moves to the choripan stands on Sante Fe. You aren’t able to pass up the choripan. You only have two more full days in the city but you’re a little run down from all you’ve been jamming in to your visit so you opt for a spa package. For $85 you spend over four hours being pampered and then sleeping in the sun. You treat yourself to an hour and a half massage, a facial, and enjoy the sauna, pool, and rooftop solarium. Afterwards, you walk over to the nearby Recoleta fair where you browse books and gifts in the ritzy part of town. It’s a beautiful Saturday afternoon – perfect for ice cream. Your tiramisu/lemon chocolate mousse cone is surprisingly like Italian gelato. This is a great day. A month ago you made reservations for an underground restaurant you read about in the travel section of the New York Times. Casa Salt Shaker is one of the puertas cerradas, secret dining experiences available in Buenos Aires. Chef and sommelier Dan Perlman and Host Henry Tapia open their home on weekend evenings to diners who choose to experience their themed, five course meals. Tonight’s dinner is in homage to Henry’s hometown of Lima and to Veracruz, Mexico. It’s entitled “Aztec-Inca Face-Off” with dishes that might have been served in the respective empires. You opt for the additional wine pairing and learn about regional wines of Mendoza. Ciudad Konex is your party destination following dinner. From Barrio Norte, it’s a ten-minute taxi ride to Abasto, home of the factory turned night club. There’s a Balkan themed party tonight with the band “Kosovo Ska” and a tango/ baile funk orchestra performing live. The main space is a converted parking lot with a stage, dance floor and bar. There are probably over a thousand people in attendance including the outdoor courtyard that has swings, a stairway and stage, and paper mache mushrooms. Like in the other boliches and bars you’ve visited, the party at Konex goes until past dawn and includes deejays, projections, and friendly partygoers. The fiesta tonight is like an underground party or a rave, minus the heavy drug usage. It’s a happy celebration and it’s hard to leave but you have one last place you want to try out before you go to bed. Guevara, named for Che, is just off Plaza Dorrego in San Telmo. There’s no sign but the mask and angel wings in the window is a dead giveaway. This ramshackle bar has an awesome crowd and draft pitchers for $1 USD. There are two floors in a small space full of locals and travelers. You can order over the balcony of the second floor and the bartender hands your drinks up to you. It’s grimy and popular and you find the sidewalk in front of Guevara is a perfect place to watch the sunrise, urban Argentina style. It’s your last real night out so you decide to go big and stay up in San Telmo for the morning Feria de Antiguedades. Your new friends from Guevara keep you company as your beers become morning coffee in the square. Vendors set up stands in every inch of space and there are antique cameras, furnishings, hats, jewelry, and Peron memorabilia as far as the eye can see. Tango bands play in the street and tourists flock from every angle. By noon, you’ve maxed out your capacity for people watching and souvenir shopping. You get a cab to nearby La Boca to see the port and the neighborhood famous for its brightly colored houses along El Caminito. After lunch and more tango music, a taxi brings you to your apartment where you sleep for hours. You get up just in time to make it to La Viruta down the street in the basement of the Armenian Cultural Center. There, you enter the rec-room-like space that is the epicenter of Argentina’s tango circuit. A group lesson at 8pm lasts nearly two hours while you pick up the basics and watch pairs of professionals in a skating rink-like setting. The time flies by while you’ve been mesmerized by the intimate performances in this casual setting full of singles and couples of every age and nationality. You’ve never cared about any kind of ballroom dancing but at La Viruta you come to understand the hype and surprisingly, you’ve become inducted and emerge a tango fan. Brazil is calling and you have to leave Argentina. On the way to the airport you have your last breakfast in Plaza Serrano and say goodbye to Buenos Aires, vowing to return for more steak, tango, culture, and nightlife. The people you’ve met have made a lasting impression in a very short time. They really are beautiful, inside and out, and you’re sure you’ll be back soon for another visit. Or feel free to get in touch with one of the many Matador members living in Buenos Aires right now.